I’ve been thinking a lot lately about energy. I’ve become painfully aware that my reserves are finite and I can’t draw on what isn’t there to be drawn on. I’d love to plough on, flogging the dying horse, but a dead horse is only good for cheap burgers and that’s not what I’m here for. 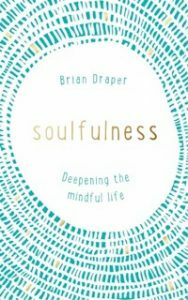 When I was invited to the press day for Brian Draper’s new book, ‘Soulfulness’ (Hodder & Stoughton), I was keen to get there, although it didn’t quite fit in the day. I’ve admired Brian and his brand of spirituality from a distance for a long time, and I loved the fact that we’d be treated to a practical introduction to the themes of his book before our interview slots. We met on the snazzy rooftop terrace café at Hodder HQ, a group of six and Brian, our guide. My morning had been a prime example of trying to accomplish more than I am actually able to- double and triple-tasking and dropping balls with gay abandon. I was sweaty and distracted and slightly manic. ciously relax the bits of us that were tense. My left thigh hurt, but I think that was because I was sitting cross legged, which I haven’t done in a while. He asked us to breath more deeply- long, slow ins and outs. Be still, he said. Know that I am God (he was quoting the Bible, let me hasten to reassure you). We sat quietly, high above the Thames, above the traffic and the construction and the tourists. And then he talked about energy. There are good ways we expend our energy, on the things God made us to do, the things we love doing and that make us feel happy and whole and useful. But we can’t stay in performance mode all the time. If we ignore the signs that we’ve reached our limit, we enter survival mode. Here we function below par. Things suffer, like our health and our relationships. If we’re not careful, we burn out. If, however, we are tuned in to those signs and choose to do things that recharge us, we can live by an ‘unforced rhythm of grace’, where our souls are restored, and once restored we give and work and create. Today might have been draining. I acknowledge it was too busy. But it was important for me to hear what Brian had to say, and my soul will benefit. I recognise both these kinds of days. Often I’m operating a bit beyond my limits, but today, though I woke at 5.30 & got up soon after, I’ve been doing all kinds of things that God made me to do & that I love doing ( from writing letters & emails, to ironing & phonecalls & talking with neighbours ), so tonight I feel happy & whole & useful! Thanks for a great blog Jo, & thanks Brian, for these life-giving reminders.